from Lemon Shortbread, she is called "fairy flower scent." She was a delight to colour with my promarkers. and diecut the number 3 (mirri card) and her name. The little penant on the top right hand side is also a diecut. The backing paper came from a freebie paper pack. from Pink Petticoat (no longer trading). 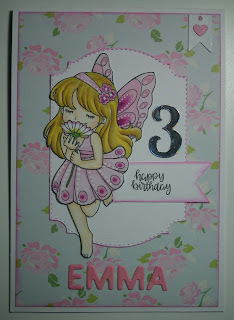 Really pretty card, thank you for joining the CRAFT challenge this week. awwwww....so cute and beautiful ..! Thank you for joining the challenge in Crafting With An Attitude. Very pretty card.Thanks for joining us at Through the craftroom door this week. Great card, very pretty. Lovely fairy image that any girl would love. Thanks for joining us at The Paper Shelter this week. Thank you for joining us at I Love Pro Markers Challenge Blog. Thank you for playing along with us over on the I♥ProMarkers challenge blog.